6-piece, female lead vocals, 2x1 hour or 3x40 minute sets. Recorded music during breaks. 80s Phantazie, six-piece tribute band to the 80s, is a high energy rollercoaster ride through on of the great decades of pop. 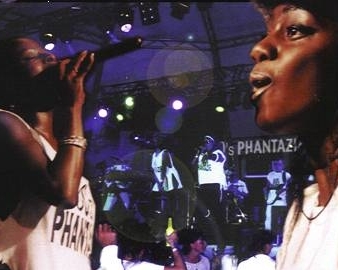 Individually the members of 80s Phantazie have played virtually every university in the British Isles and performed at corporate and private functions in America, throughout Europe and across to Israel. The band is made up of some of the UK’s top session musicians with credits ranging from Robbie Williams, Gary Numan, Blur and Lisa Stansfield as well as performances on Top Of The Pops, The National Lottery and even Noels House Party. 80s Phantazie normally play two 45-minute sets or one 90-minute set but this can be extended by arrangement. They can also provide background music on CD before, in between breaks and after the performance has finished at no extra charge. 80s Phantazie have a professional PA system and lighting rig. "Fantastic! Brilliant performance by true professionals! Definitely having them back for a 3rd time." "We would like to thank Phantazie for their amazing performance on our special day! They were fantastic!!"